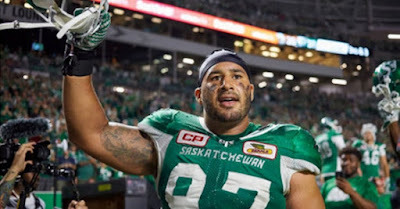 The Saskatchewan Roughriders' newest signing, defensive tackle Eddie Steele, was a guest on 620 CKRM's SportsCage on Friday discussing his new contract which was announced on Wednesday. It took just past a month into free agency for Steele and the Riders to agree on a one-year deal for 2018. "It's the business. It's a process," Steele explained while driving to Saskatoon for a player appearance. "I was doing my due diligence as far as talking to teams and handling that side of things. I've been through it before and you just have to be patient. I wasn't too worried even though it got into March. I was following up on all ends." Although Steele tested the free agent market, he was excited to be able to come to terms with the #1 team on his wishlist. "Absolutely. I'm more than excited," Steele offered. "It's going to be a lot of fun. Coach Jones and staff have added some great pieces and I'm really excited to be a part of it this year." Steele said he's eager to take to the field with the new additions on the Riders' defensive line. "We did nothing to get worse, that's for sure," Steele said of the Riders' off-season moves. 'We added some really talented players in there. Charleston Hughes, I've been watching him for years and have nothing but respect for him. Zack Evans is a nasty dog in there and he adds a real physical presence. We only got better. I'm really excited to play with these guys, and we're going to be real physical up front." The 2017 CFL season was Eddie's first in Saskatchewan after spending several years with the Edmonton Eskimos. He knows expectations for the 2018 Roughriders are extremely high, but feels that's a good thing. "Honestly the simplest answer is that it's a mentality," Steele continued. "When we won in Edmonton in 2016 - and I hate to refer back to that because we're the Riders now - but with the Eskimos we expected to win. We need to develop that mentality and expectation because there's no lack of talent. I get kind of emotional talking about it but expectations are high and we should meet them. We need to go into camp expecting to do the type of damage that people think that we can do." In the meantime, Steele is travelling to all corners of the province speaking to youth as part of the Red Cross Imagine No-Bullying campaign, and other Rider community initiatives. "The thing I like the most about that is getting the opportunity to share my stories with the kids and hope they didn't make the same mistakes I did growing up," Steele explained. "I hope to better equip them with the tools so they make the proper choices that I didn't. That's what gives me the most fulfillment; to have the opportunity to give back."